3.Excellent anti-static properties and small dimensional. 4.Excellent procession properties for punching, bending, printing and forming. 5.Uniform embossing, resistant to scratches and fingerprint traces. 6.Containing no fire retarding chemicals, such as bromine. We have built over 30years relationship with Mitsubishi Plastics Inc. We have been trying to develop market of various products of Mitsubishi to all over the world as an official distributor. Now we mainly export to Asian countries such as Korea, China, Taiwan, South east of Asian countries. Hishi Plate is used for materials of manufacturing equipments and devices for Semi-conductor, LCD, PCB in high-tech industries. Also there are materials available in Hishi Plate, such as lead free plate to meet environmental regulations, and fire- retardant plate approved by the FM4910 standard. Alset is a composite coil which is made of plastic film and metal sheet. 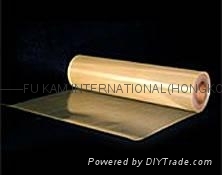 Both plastic film and metal sheet are firmly adhered by special surface treatment without adhesive. This materials has been used widely for various kinds of electronic parts and components. "IBUKI" is a super engineering plastic film that greatly shortens the manufacturing process for multi-layer circuit boards. Used for the base material is polyetheretherketon (PEEK), a recyclable thermoplastic resin film. In the multi-layer circuit board production process, meanwhile, this enables individual board layers to be independently generated with patterns, and then simply stacked and heat pressed to easily form integrated or build up multi-layer boards. This is a major step in shortening the manufacturing process and cutting the costs involved. Easy to form and press at low temp.(approx. 200degC). Thermal margin at forming and pressing are wide. Linear Expansion property is controllable. High density PWB without glass cloth. Narrow pitch drilling, laser through hole process. Plating by any kind of system available. >> Multi-layered Interposer PWB for PKG. Batch processed Multi-layered PWB w/components(SIP PWB). FPC board for connecting PWBs. Core PWB for Build-up PWBs. DIALAMY is fire-retardant polyester film developed by MITSUBISHI PLASTICS INC. by using its unique fire retardant technology and state-of the-art processing technology. Compliant with the UL Standards 94-VTM-0 as polyester film, it has excellent fire retardant property. DIANIUM is a fire retardant electric insulation sheet in non-halogen series and is qualified in UL regulation. Like heat-resistant polyvinyl chloride sheet, the sheet is available for punching and bending works. It is mainly used as an insulating material for electric and office equipment. 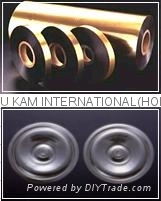 "SUPERIO-UT"a ultra heat-resistant engineering plastic film made of "ULTEM"(polyetherimide resin "PEI") developed by GE Plastics, Inc.(USA) employing Mitsubishi Plastics, Inc.'s technology.There are two types of products, E and F type and especially F type is suitable for insulation material as it has an excellent heat resistance under stress and solvent resistance. 1.Thin layer, high accuracy of film thickness and available in long length. 2.As it has protective cover sheet (polyester film), keeps the film from dust gathering and easy secondary handling. 3.Embossed film improving surface slippage is available. 4.Film of low molecular weight and reduced siloxane content is available for electric and electronic applications. 5.Silicon/PET film adhesion type is also available. 6.Modified silicon rubber layer can be made and available. 1.Cushion material for LCD Panel. 5.Water and moisture proof packing..